Have you ever had such a great workout that you couldn’t wait to go back for more? Well then ladies and gentlemen, let me introduce you to one of the most amazing workouts you will ever experience! I present to you, Pilates ProWorks in Coral Gables. 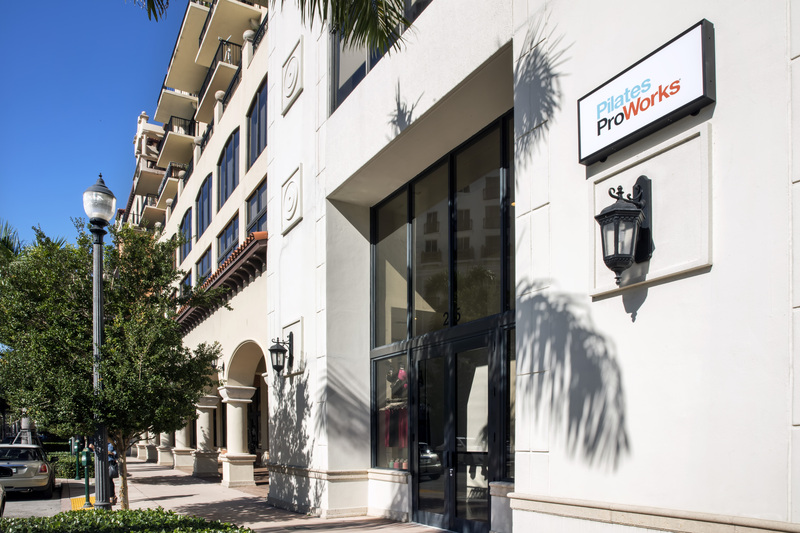 Located in the heart of Coral Gables at 25 Merrick Way (across from Pollo Tropical), Pilates ProWorks is a beautiful studio that offers a modern twist on traditional Pilates and boxing classes. Whether you’re a beginner, like me, or a fitness buff who is a pro Pilates master, the studio has something for everyone. The space is sleek, modern, stylish, and a little too pretty to make you forget you will be sweating like a champ once you walk out of there. The concept of Pilates ProWorks was founded in 2010 by husband and wife, Oscar Sanin and Taylor Carter in San Francisco after Oscar suffered terrible injuries from an accident and wanted an alternative to surgery. He was introduced to Pilates by his doctor and soon he was in amazement of the strength and improvements he made in such short time. Soon he began to work with designers and fitness consultants to create a Pilates machine that was more comfortable and the FitFormer™ was born. He opened a studio, offered group classes and the rest blossomed from there and they expanded from the west coast to Latin America, the northeast, and now their first studio on the southeast coast here in Miami. What makes this better than other gyms or studios, well let me tell you. When I went to take my very first class I had no idea what I had in store. I had done Pilates and yoga a few times before but never with a machine and I was a bit nervous. The workout is a 55-minute session that makes you sweat, test your limits, and push your muscles to places you never even thought of. Let’s be honest, I have taken many spinning, aerobics, and crossfit classes in the past, but this class was no joke. Within 5 minutes I was already sweating and shaking. The great thing about the class is that everyone is struggling together and the instructors help you out along the way. Don’t worry, if you fall no one will laugh, they’re too focused on not falling themselves. The class is set to music and it’s never overcrowded. You feel completely comfortable going at your own pace and no one is judging. I will warn you, you will leave there and be sore in places you didn’t think you could be sore- trust me. In addition to the Pilates Pro class they also offer matBox which is a full-body workout that brings together Kickboxing, Pilates and Yoga into one powerful 55-minute session; I’m going back next week just to try this out. It’s a perfect workout to keep your body toned, lean, and stretched all year round and it’s fits any schedule. Another great thing about this studio is that they provide you with everything you need. If you don’t have gloves you can rent them for $2 or you can buy them at the studio as well. It’s a beautiful and clean environment for your to get down right sweaty. Seriously, if you’re like me and always on the hunt for a good workout, definitely go check them out. They’re open Monday through Sunday from 6:30am to their last class at 7:30pm, so you have no excuses. The memberships are available on a class package or monthly unlimited package for those that want to go hard-core and go every single day. For me, I’ll stick to one time a week and even with that, I already feel and see a change. Pilates ProWorks® is a fitness concept centered on Pilates – with a modern, innovative twist – that tones and strengthens body, mind, and spirit. Using a combination of custom machinery and a wide range of upbeat classes that fuse Pilates with everything from barre to yoga to boxing, participants achieve healthy results without the pain or harm of high-impact workouts. Any specials at this place? First class free? Let me know! Hiiii! They don’t have a free first class, however, they have a cheaper price for the first class. It’s $20 for the first class for new clients, normally they are $30.